Entertainment Studios, Inc. the largest independent producer and distributor of first-run syndicated television programming for broadcast television stations, and owner of seven 24-hour HD television networks proudly announces that Tribune, Weigel and CBS Television Station Groups have given a firm "go" to carry both The First Family and Mr. Box Office as part of a two-hour primetime weekend comedy block, which has been cleared in over 85% of U.S. television homes. Both sitcoms will air two half-hours, back-to-back, creating a two-hour primetime sitcom block. Each sitcom has an initial order of 104 episodes — for a total of 208 episodes for the primetime comedy block. We have mentioned both of these comedies already (The First Family and Mr. Box Office), but now we know that it will be in at least 85% of the country on weekends in local syndication. There might be a cable pick-up too, so stay tuned for that news. Also stay with us for a list of local affiliates airing these two new comedies. So if your market has a Tribune, Weigel or CBS Television Station Group station, then you're looking good to see these two sitcoms this fall! 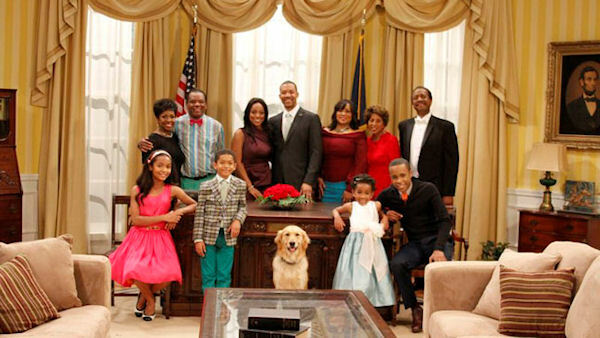 The First Family is a sitcom about an African-American family that resides in The White House. It features an all-star cast including Christopher B. Duncan (The Jamie Foxx Show), Kellita Smith (The Bernie Mac Show), Gladys Knight (Dancing with the Stars), Jackee Harry (227, Sister Sister), John Witherspoon (The Wayans Bros.), Marla Gibbs (The Jeffersons, 227), and Michael D. Roberts (Seinfeld). Mr. Box Office is a sitcom about one of the world's biggest movie stars, who is sentenced to community service teaching English at an inner-city high school in South Central Los Angeles. It features an all-star cast including Bill Bellamy, Jon Lovitz, Vivica A. Fox, Keshia Knight Pulliam (The Cosby Show), Rick Fox, Gary Busey, Alex Thomas, Tony T. Roberts, and Tim Meadows (SNL). This Memorial Day, Antenna TV salutes the toughest soldiers to serve on the silver screen with a full day "Movie Hero" Marathon on Memorial Day - Monday, May 28. Antenna TV, which airs on 61 affiliates across the U.S. reaching 58% of TV households, will air the best battles from sun up to sun down with 10 classic war movies. Antenna TV's Movie Hero Marathon on Memorial Day will feature: Hellcats of the Navy (1957), Battle of the Coral Sea (1959), Mission Over Korea (1953), All The Young Men (1960), The Mountain Road (1960), King Rat (1965), Bitter Victory (1958), Sahara (1943), Castle Keep (1969) and Anzio (1968) -- from 5am-2am ET. Featured stars include: George Segal in King Rat; Sidney Poitier in All the Young Men; James Stewart in The Mountain Road; Humphrey Bogart in Sahara; Robert Mitchum in Anzio and Burt Lancaster in Castle Keep. Plus, Hellcats of the Navy, is the only film Ronald Reagan made with wife Nancy. Also, New Yorkers, please don't forget the new channel position on WPIX 11.2.